If you have read the page on using a pastel fixative to seal and protect your pastel paintings, then you will not want to miss this alternative that I recently learned from a fellow artist. He has experimented with a variety of ways to prevent pastel dust from shedding. He finally settled on this method. Lay the painting flat on the ground–preferably taped to foam core or another sturdy support. Make sure that the surface is flat and not buckled. Now pour some distilled water into the steam iron and turn it to medium high heat. Wait until there are no water drops emerging and a good strong jet of steam is emerging. Hold the iron level, about 2 inches (5 cm) above the painting. 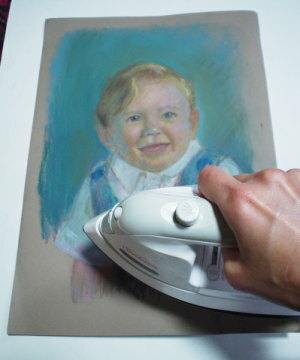 Make multiple passes over the painting, just like you would with a spray bottle of fixative. Watch out for water drops. Make sure that the entire painting is dry before you move it; to be sure, let it dry overnight. Once the painting is dry, it is ready to go. Note: This steam fixing method keeps the dust come off of the painting during regular handling, but if you deliberately rub the it with your finger, the dust will come off. Find out more about pastel techniques, tips, what types of surfaces you need, and even making your own colors!